Seattle Opera Blog: Announcing our 50th Anniversary Season! Announcing our 50th Anniversary Season! Because it’s a Ring year, we had to wait a little longer than usual to announce our 2013/14 season—but here it finally is! Soprano Sarah Coburn (pictured here in Seattle Opera's 2011 production of The Barber of Seville) stars as Marie on opening night of The Daughter of the Regiment. For our Golden Anniversary season, we’re presenting four operas that offer comedy and tragedy, reality and fantasy. We kick things off in October with Donizetti’s light-hearted romantic comedy Daughter of the Regiment, about an orphan—raised by a group of a French soldiers—who falls in love with a local villager and must overcome social expectations. Soprano Sarah Coburn reunites with tenor Lawrence Brownlee (they were last seen at Seattle Opera in 2011’s The Barber of Seville) as Marie and Tonio on opening night. For more info on the production and a more complete cast list (including bios, headshots, and audio clips), visit our Daughter of the Regiment webpage. Seattle Opera’s 2004 production of Rigoletto. We begin 2014 with our second opera of the season: Verdi's Rigoletto, about a quest for revenge that leads to tragic results. Set in the 1930s, this production stars Italian baritone Marco Vratogna as Rigoletto, the court jester who fails to keep his beautiful daughter, Gilda, away from the womanizing Duke of Mantua. The opening night cast also stars soprano Davinia Rodríguez as the ill-fated Gilda, with tenor Francesco Demuro—who sings Rodolfo in next month’s La bohème—as the Duke. For more info, click here. Soprano Marcy Stonikas (pictured here in Seattle Opera's Young Artists 2011 production of Don Giovanni) returns as Magda Sorel in The Consul. 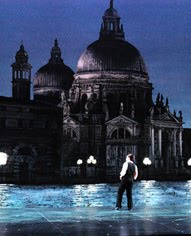 Quickly following Rigoletto is our February 2014 production of Menotti’s The Consul—a Seattle Opera premiere! We’re very excited to mount this Pulitzer Prize-winning thriller, which premiered in 1950. Following her leading turns as both Turandot and Fidelio’s Leonore this season, soprano Marcy Stonikas returns to the company as Magda Sorel, a wife and mother desperate to acquire a visa to flee a totalitarian nation. Baritone Michael Todd Simpson plays her husband, John, a political dissident on the run, and mezzo-soprano Lucille Beer—fresh off her company debut as Erda in the Ring—sings the role of his Mother. Also in The Consul is Sarah Larsen, who just wrapped up a run of performances as Tisbe in La Cenerentola. For more info, click here. The Venice scene in Seattle Opera’s production of The Tales of Hoffmann. The season concludes in May with the return of Seattle Opera’s hit production of Offenbach’s Tales of Hoffmann. Stage Director Chris Alexander won the company’s Artist of the Year Award when this production premiered in 2005, and he returns for it in 2014. Tenor and audience favorite William Burden makes his role debut as the storytelling Hoffmann, who spins weird and wondrous yarns about romancing three beautiful women, all portrayed on opening night by French soprano Norah Amsellem. 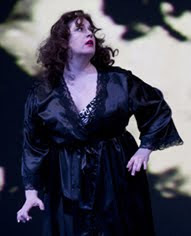 Mezzo-soprano Kate Lindsey, winner of Seattle Opera’s 2010 Artist of the Year Award for creating the title role in Amelia, sings her critically acclaimed Muse/Nicklausse. For more info, click here. Single tickets for select performances won't go on sale until July, but you can secure your seats as part of a subscription package beginning February 1.